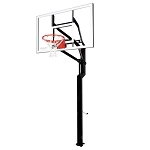 Goalsetter In Ground Basketball Hoops - Internal Height Adjustment All-American 60 inch Acrylic Backboard. 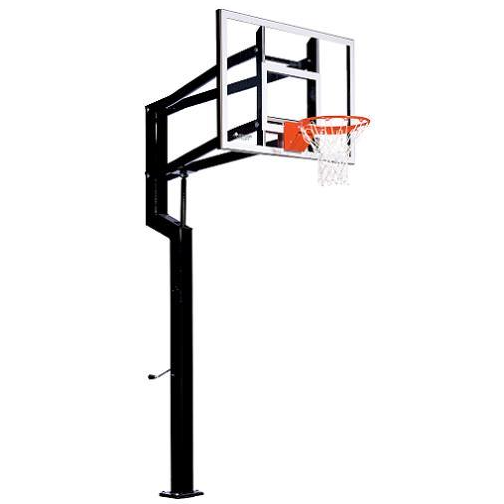 The All-American Goalsetter basketball hoops is the best selling system from Goalsetter. This system was one of their first designs and has subsequently been tweaked to perfection. This system has a sturdy 5x5 inch square pole and an acrylic backboard. This system provides an economical solution to your personal home court or other residential use. 60 in. x 38 in. x 3/8 in. acrylic backboard with 1 1/2 inch steel frame. Acrylic does not provide as good of a rebound as glass, but Goalsetter warranties acrylic backboards for nonresidential uses. Design provides a 3 Ft. clearance between back of the backboard and the pole. One-piece die formed extension arms. offset pole design for better weight distribution. Pole installation accomplished via patented hinge system. Hinge-system allows for complete construction of the system before the goal is raised to its upright position. Ground Anchored pole for optimum stability. Height Adjustable from 6 Ft. to 10 Ft. using an internal crank. Packaging includes touch up paint and all necessary hardware. Product ships via an LTL carrier. Typically leaves the warehouse within 1 business days and spends 3-6 business days in transit. Choice of 5 different rims. Product weight about 385 lbs. Suggested installation with at least the help of 3 strong adults. 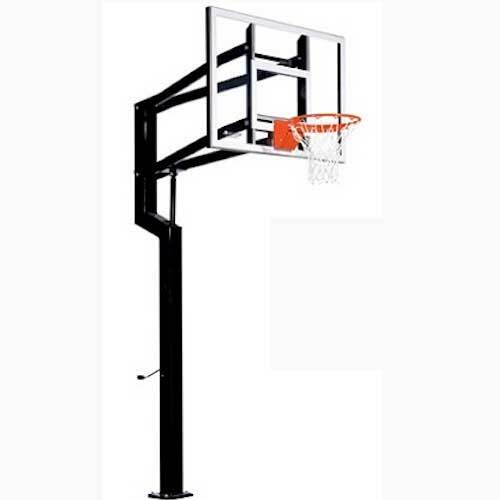 Competitive Edge Products is an authorized dealer of Goalsetter Basketball Hoops. If you find this model of All-American Internal Height Adjustment Acrylic backboard goal for cheaper anywhere else online, please let us know. We will try to match or beat their advertised price (price of the product + any shipping costs). This was the easiest system to set up ... we were a little concerned when researching for in ground hoops, with reviewers comments stating the difficulty, time, etc. involved .... some saying they needed extra help, or it took more than a day to assemble ..... this one my husband put together in less than 2 hours, with the easiest and clearest instructions ever ..... and it took that long because he had to go to the hardware store .... didn't take an army of strong people to put the pole in position either, just 2 adults, and i put in the bolts .... how easy!!! just one thing, instructions called for 12-14 60 lb bags of concrete, my husband bought 24 and had to buy a 25th! ... course, he probably made the hole a little bigger probably, around 50 inches deep by 24 inches wide .... anyway, would recommend the Goalsetter all-American. This system is very durable and works great. We love that it is made in the USA. This hoop was so easy to put together. The all-American is very sturdy to dunk on. The height adjustment on this hoop is easy for our 10 yr. old to use. Our family loves our new system! This hoop is amazing. Was very easy to assemble and will be easy to move when we do. This is the closest to professional you can get. Easily installed and sturdy as well. Very well made. I recommend it for the price. This is a high quality system that is very easy to adjust. Works great for our kids and their friends. Q: How many pieces is the pole? Fast Shipping: Orders for the Goalsetter SSAAAI generally leave the warehouse within 2-4 business days.